I purchased 4 yards of red felt, 1 yard of black felt, 1 yard of white felt, and 1 yard of grey felt as well as some foam. I also got some elastic (for the waist) and sat down to try to figure it out, without a pattern, and only a picture on a video game as instruction! I found a pair of his pants that fit like I wanted the costume to fit and laid them out on the felt. I cut front and back. Sewed, had him try on, then added elastic at the waist. Then I attempted the shirt. I cut front and back and sleeves individually. Then sewed the sleeves and played around with it (with much error) until I found out the best way to add the sleeves and complete the shirt. Next I did the hands. I found some winter gloves and laid one on the felt. I cut a circular shape out of the felt and sewed it all (except the wrists). Then I turned them inside out and added a little stuffing. I inserted his gloves and sewed them inside the hand (so he just puts on the gloves and the hands stay on easily). For the nails I cut the shape out of grey felt, hot gluing them to the hand. I pinned them with straight pins while the glue dried. Now came the time to tackle the head. Honestly, this was the one part I was most afraid of. I've never attempted anything like this before and I was seriously concerned on how I would take it on especially considering how much I know my son hates masks on his face! I started with a baseball cap. I adjusted it to fit his head. I glued some foam to the bill (shaped like the bill, but a bit longer). I glued on the appropriate felt for this to be the top part of the mouth. Then I cut felt for the hat to build it up some. I then cut foam to match the top part of the mouth, and for the bottom part of the mouth. Then I glued the appropriate fabric on it, to make it look like the bottom of the mouth. For the top of the head I draped the fabric over the top of the hat, hot gluing it periodically. I added hot glue to the bottom part of the mouth and to the top, then added clamps to hold it tight while it dried. I also glued some foam inside the hat and added an elastic band, so that it would pick the hat up off my son's head so he could see more easily. 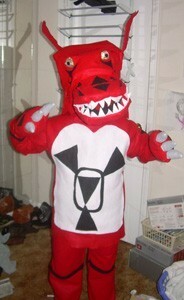 Then I added all the accents (black diamonds and such) that are on Guilmon's body. Wow! You did a lot of work on this cute costume - great looking costume. Better than from a store!